What do people think about the 2015 Ford Mustang? Also check out its engine sound while revving! Since the mid 1960’s you knew this hot muscle car which had its own elegant and aggressive signature and now the 2015 Ford Mustang is totally changed from what you’ve been used to. 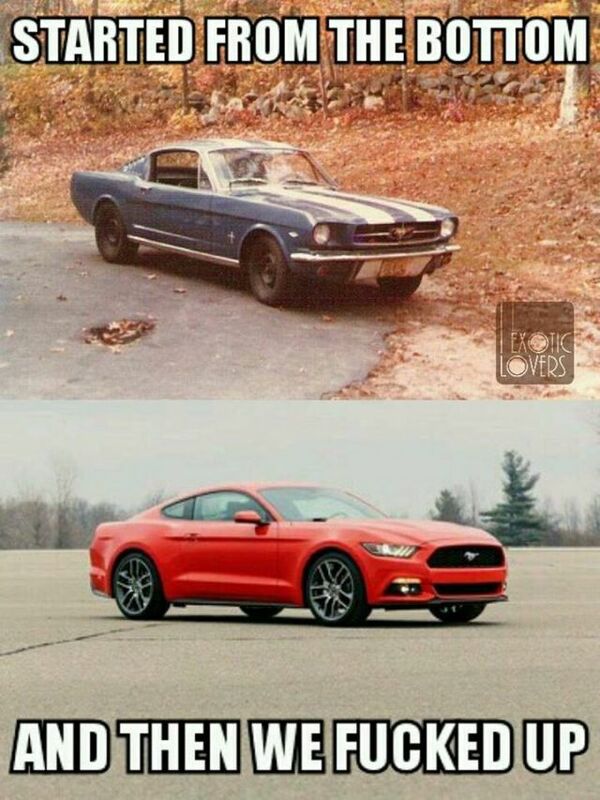 The “old” muscle car went through a remake and now it has a total new look which resembles to one of a sports car but the sound… omg that engine sound from the 5.0 litre v8 engine.. It really gives me an eargasm! The car engine that’s on the 2015 Ford Mustang gives you “only” 420 horsepower that can propel it to a top speed of 160 mp/h or 260 km/h! If you choose the 2.3 litre EcoBoost engine which has a better mileage or fuel consumption, you’ll only get 305 horsepower and I don’t know if you’ll hear that exact rumbling v8 noise which you get on the 5.0 litre version! 1.It has a Nissan GTR roof line, 370z rear end with Mustang tail lights, Aston Martin front grill and a Taurus hood. This will attract new buyers who never gave the Mustang a second look but what will happen to the auto enthusiasts who loved the classic Mustang? 2.The rear quarter window has an Aston Martin feel just like the front grill, why isn’t Aston Martin reacting to this? 3.Needs more rumble less can sound…. 4.In a word, it’s “Crap”!. It has stolen stylings from Aston Martin, Porsche and BMW; What about its lost self identity? Such a pity. I’ve owned a lot of Mustangs and I wouldn’t touch this new one. 5.I’d rather drive a Tesla. I personally think that Ford struggled with its mind only on car care and good looks for this final result which is quite a nice muscle car; The acquisition cost for the 2015 Ford Mustang or price tag is rumoured to a 24,000 $ base model. After seeing the car specs, price and that awesome youtube video with the 2015 Ford Mustang start up and engine sound, what do you think? Would you consider buying this muscle car that’s made with great care of cars?